The Circulon Infinite Hard Anodized Nonstick 10-Piece Cookware Set makes you want to cook all day. The name of this cookware set was not chosen randomly. You can use every piece from this set infinitely. Circulon has perfected the manufacturing techniques for their cookware. 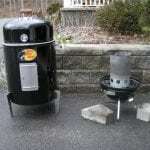 They have applied a layer of hard-anodized aluminum, then a thick layer of aluminum only and on top of that, they have obtained durability by adding a layer of stainless steel. The purpose of the aluminum core is to distribute the heat on the entire surface of the pan, making things easier for you. 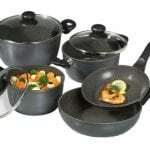 The saucepans and the skillets from this set feature an interior that protected the non-stick capability and enables you to use utensils made of metal while you cook. This innovation makes a substantial difference in terms of durability. Basically, you can not scratch the interior of any piece, because it is protected by layers arranged in the form of a spiral. 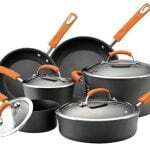 Circulon Infinite Hard Anodized Nonstick 10-Piece Cookware Set benefits of the Total Food Release System, which makes the pieces almost impossible to scratch. Circulon saves you from a lot of work too. This set can be washed in the dishwasher, so you will not have to take every piece by hand. However, they are extremely easy to clean by hand as well. 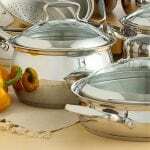 Circulon is known for the creation of a large variety of pots and pans. They have patented numerous manufacturing technologies. They aim to produce the most durable cookware on the market. So far, they have succeeded by introducing the hard-anodized aluminum. This material was proven to be twice as hard compared with stainless steel. After a long presence in this business, Circulon still aims at delivering professional-quality cookware for every home. 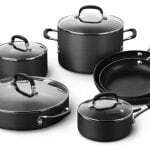 They know how important a good cookware set is, so their offer includes all sorts of pots and pans made to ease up the cook’s work and last over time. 5 and 2-quart covered saucepans, 8-quart covered stockpot, 3-quart covered saute pan, 8” and 10-“ open skillets. Excellent design and shape – This cookware set features silver and dark grey colors and its overall aspect is more than presentable. 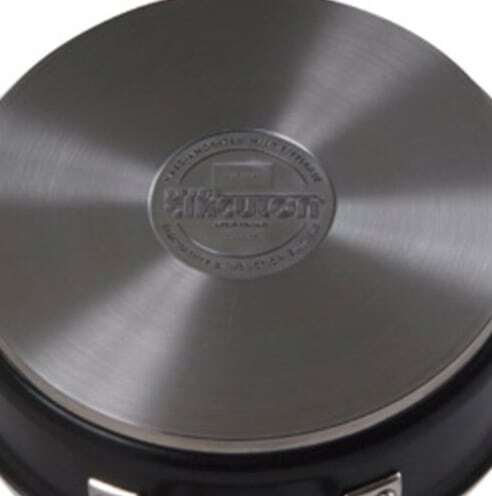 Excellent cooking conditions – The snug-fitting stainless-steel lids preserve the temperature from the pots or pans intact and they are safe to grab without gloves. Infinitely durable materials – You can enjoy this set for a lifetime because of the combination between aluminum and stainless steel. Both are extremely durable materials. 3-layer Autograph nonstick from DuPont – The food does not stick to any surface of this cookware. So, expect no mess, just perfectly cooked dishes. Not easy to handle – The components are a little on the heavier side, fact which is not advantageous to people with less physical strength. 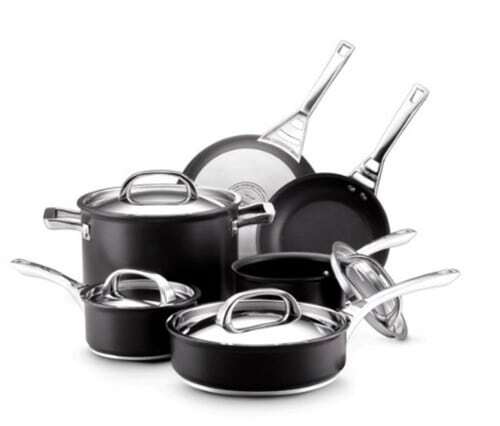 Circulon Infinite Hard Anodized Nonstick 10-Piece Cookware Set can not miss from your kitchen. 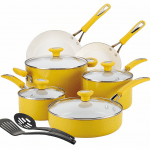 It has all the desirable features for a basic cookware set. Circulon has made sure to provide you with the most resistant materials and to reduce the time you spend in the kitchen. All the technologies used for making these pots and pans were invented to meet the most exigent expectations.